Every historic hotel in Venice has its own interesting history, and the prestigious Cipriani & Palazzo Vendramin is no exception. In 2011, this fabulous hotel on Giudecca Island became the leader of the prestigious Virtuoso rating, leaving behind as many as 950 competitors. The hotel is included in the list of the best hotels in the world, «Best of The Best», so there’s no wonder why so many celebrities choose it for their visit in Venice. 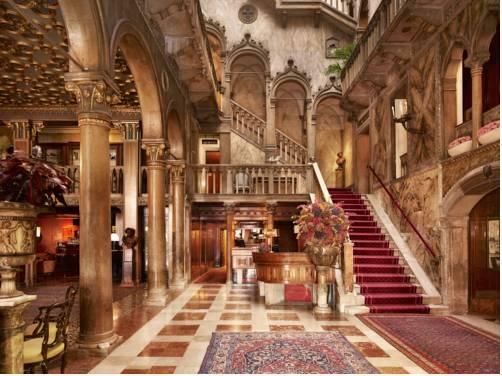 Hotel Danieli is one of the oldest and most prestigious hotels in Venice. First guests appeared there yet in the 14th century. The unique palace, in which the original hotel was open, has been carefully restored. Later, new guest rooms appeared in the neighboring historic buildings that were constructed later. During its long history, the hotel greeted many famous guests. Luxuriously decorated guest rooms attracted Charles Dickens, Frederic Chopin and George Sand. Each of the palaces in the complex has its own miraculous story. The oldest building belonged to the noble Dandolo family. The 14th-century palace still has the carefully preserved apartment of the Doge. Without a doubt, that’s one of the most luxurious guest rooms in whole Venice. Family holidays with kids in Venice. How to entertain your child, things to show to children. Gritti Palace hotel has a no less interesting history. The eye-catching historic building was constructed in the 15th century. It belonged to the noble patrician Pisani family. During the building of the palace, several older buildings remained in its territory, and that makes Gritti Palace an important historic landmark. Later, the palace belonged to even more famous Gritti family, so a collection of artworks and precious accessories was only growing each century. The last extensive restoration of the palace took place more than 30 years ago. At that time, all antique furniture was carefully restored. Some guest rooms have the same design that is unchanged for many decades. There is a guest room in the ancient palace where Earnest Hemingway lived for quite a long time. This is the place where he worked over his novel Across the River and into the Trees. Fans of Peggy Guggenheim are also well-aware of Gritti Palace as she celebrated her 80th anniversary in one of the most luxurious guest rooms in the hotel in 1978. Bauer Palazzo has a fantastic location – a beautiful 18th-century palace. Austrian entrepreneur Julius Grünwald and his wife were the first owners of the hotel. By the way, the wife was a daughter of Mr. Bauer who was the owner of the famous De la Ville hotel in the end of the 19th century. In 1930, Bauer Palazzo got a new owner – shipbuilder Arnaldo Bennati. Under his guidance, the hotel was fully restored. During that extensive renovation, which took almost 10 years, the building got a new modern unit. Despite the fact that nowadays the two buildings, which belong to different epochs, are two different hotels, they are still connected by a system of passages. Therefore, everyone is welcome to visit the historic building. This guide to legendary hotels in Venice is protected by the copyright law. You can re-publish this content with mandatory attribution: direct and active hyperlink to www.orangesmile.com.